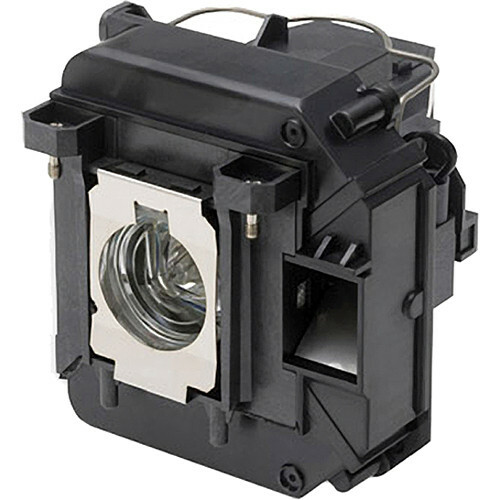 The V13H010L61 Replacement Lamp from Epson is a certified direct replacement for the original lamp in the EB-910W, EB-925, and 915W Projectors. Its estimated life is 4000 hours in the projector's standard mode and 6000 hours in economic mode. It has a 90-day limited warranty. Box Dimensions (LxWxH) 6.2 x 5.6 x 5.5"
V13H010L61 Replacement Lamp is rated 5.0 out of 5 by 3. Rated 5 out of 5 by David from Genuine Epson Lamp - Don't settle for generic substitutes I tried a few less expensive replacements. One didn't work. One was dimmer with the color temperature off. The B&H genuine Epson lamp was the only one that matched the original image. These lamps do last longer than most Rated at well over 2000 hours, I replaced one with 900 hours and the image was nearly the same as the new lamp. Solid product. Rated 5 out of 5 by Anonymous from Great buy It is a real Epson lamp. First place I have bought an OEM one that really is. It is much brighter of a bulb. I will only be buying them from here from now on. Free shipping was fast too. Rated 5 out of 5 by christiancruz_18 from Guaranteed Genuine Accessories The best accessory to always keep your projector in perfect working order.